Save all of your egg cartons and instead of throwing them away, recycle them to use for one or more of these egg carton kids' crafts. You'll need a few other craft supplies to complete these projects. They are all super simple and so much fun to make with your children! Spring into the season with this egg carton chick craft. Aren't these chicks so adorable? Spring Chicks Egg Carton Craft from Typically Simple. For a fun springtime project, try this egg carton flower craft! This is a fun way to create 3D art out of something you'd normally toss in the trash. Egg Carton Flower Craft from The Spruce. Use red pipe cleaners for legs on this egg carton crab. Add some googly eyes and you've got one silly ocean crab. Egg Carton Crab Craft from The Spruce. 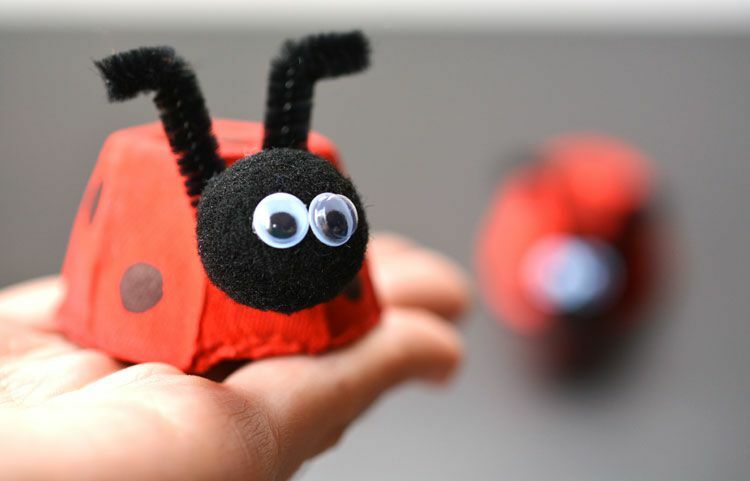 You can use egg cartons to create the perfect little ladybugs. Paint them red and add black spots for the body, and add pipe cleaner antennas and googly eyes for the head. Easy Egg Carton Ladybug from One Little Project. Add pipe cleaners to the top of egg cartons to make these bright and friendly dinosaurs. Egg Carton Dinosaurs from Kid Things. Bzzzzz! You don't have to worry about getting stung by these bees. Bumble Bee Craft for Kids from Crafty Morning. The googly eyes on these egg carton snails are hilarious! Your kids can have fun using different colors to paint their shells. Egg Carton Snail Craft from The Spruce. Make a beautiful ocean scene inside of an egg carton. Add shells, glitter, paint, and other craft supplies to help create the perfect little underwater scene. Carton Ocean Craft from The Imagination Tree. This is such a great craft to do for Earth Day! Teach your kids about the importance of recycling while recycling the very craft supply needed for this craft. Egg Carton Tree from Glued To My Crafts. Incorporate a little American history with this Mayflower boat egg carton craft. It's easy and educational! Mayflower Boat Egg Carton Craft from Woo! Jr. Kids Activities. It doesn't get much sweeter than these egg carton ice cream cones. Bright colors and "sprinkles" add a little whimsy. Egg Carton Ice Cream Cones from In The Playroom. Make an entire family of green turtles with this egg carton craft. Use green pom poms for the heads and paper for the legs. Turtle Recycled Kids Craft from Emma Owl. This awesome egg carton helicopter really flies! How cool is that? Check out this project to find out more. Flying Egg Carton Helicopter from How We Learn. This egg carton dragon is so bright and colorful! Your kids will love using this dragon for play time. Egg Carton Dragon Craft from I Heart Crafty Things. Make and display these flower magnets on your fridge for spring. Kids can gift them to grandparents for a fun little treat. Egg Carton Flower Magnets from Twitchetts. Dr. Seuss crafts are super fun. This stackable egg carton hat turns out really adorable. Kids will love painting and stacking all of the egg cartons for this project. Paint & Stack Dr. Suess Egg Carton from The Pinterested Parent. This egg carton train will provide hours of fun for your little ones. They can put toys in the egg carton train "seats" and drive them around the house. Egg Carton Train from The Craft Train. Fairies will love these little houses your kids make for them. This craft allows them to really get creative with different colors and designs. Egg Carton Fairy Houses from Creative Family Fun. These egg carton jellyfish are so creative. The tentacles are made out of different colored pony beads. Egg Carton Jellyfish from All Free Kids Crafts. Celebrate the winter season with this egg carton snowman craft. We love their little ear muffs made from pipe cleaners and pom poms. Egg Carton Snowman Craft from I Heart Arts N Crafts. These creepy crawlers are made from egg cartons that are painted black, but there is nothing scary about these cute and crafty spiders. Egg Carton Spider Craft from Kid Friendly Things To Do. Your kiddos will have so much fun crafting these egg carton goggles and wearing them for play time. They'll make a wonderful addition to your kids' costume bin. Your preschoolers can practice their colors by using this egg carton color sorting activity. Egg Carton Colour Sorting from The Imagination Tree. Craft these egg carton turkeys for Thanksgiving or any time of the year. We love this colorful craft! Egg Carton Turkeys Craft from Living Well Mom. Recycle an old egg carton to hold birdseed for this DIY bird feeder. Hang it somewhere in your yard to give birds a place to snack. DIY Birdfeeder from Ginger Snap Craft. Your kids can pretend they are big scary dinosaurs with this DIY egg carton hat. It's simpler than it looks and doesn't take much time to make. Egg Carton Dinosaur Hat from Craft Morning.